We all love camping trips, whether alone, with friends or with family members. It is a very good way to relax and unwind from our ever busy lifestyles. The camping experience is much better in suitable weather. However, weather cannot be predicted at times. Camping on a humid day is always good since there is no need to worry about providing warmth in the tent as well as insulation. It becomes worse when you get into your tent, and the heat becomes too much. That is when you will need the camping fan. The fan provides a cooling down effect after sweat activities such as hiking. Be sure to have the best night sleep with the fan. There is currently a very wide range of camping fans in the market. This makes it quite hard to determine the best ones for your camping needs. This article has however come to your aid. It has everything you need to know about camping fans. The selection process has also been made easier, and all you need to do is simply check on the one that has the features you desire. Take a look at best portable fan for camping bellow. Are you looking for a high-quality camping fan that will meet all your cooling needs? Then look no further. The O2COOL 10-inch Fan with AC adapter is the best among the fans in this category. It is designed in such a way that the result is much adorable and is also available at an affordable price. It operates on batteries so no need to worry when going camping in areas away from the grid. In case of power outage, be sure to have your fan running. The AC adapter has been included to support your extended need for cooling without having to change the batteries. The fan comes with an inbuilt handle that makes it easy to handle, store and carry. The fan blade has a patented design that maximizes on the airflow thereby extending battery life. For the best performance, always use new alkaline batteries. Do not new and old batteries. Take note that the alkaline batteries should not be mixed with their rechargeable partners as well as the carbon-zinc types. The fan is 10-inches in size with two operational speeds. It is a perfect tool for both outdoor and indoor activities. Also, this is a best tent fan was picked for you! It weighs 2.3 pounds with dimensions of 4 by 13.1 by 12.1 inches. The batteries are the 6-D type. It is made of plastic in the United States. The O2COOL 5-Inch Fan is another great pick that is much cheaper and smaller in size. It is the camping fan that meets all your needs in the most affordable way. The smaller size even makes it much convenient to carry along for such adventures. In case our editor’s pick product does not please you because of one thing or another, this is the perfect alternative. This fan operates on 2D cell batteries with the best performance realized when operated using the Polaroid D types. It can operate in the absence of electric power. It is versatile and can be used for both outdoor and indoor activities. It has two operational speeds that can be triggered one at a time for quiet cooling. The fan can be tilted to ensure directional airflow. The maximized airflow is as a result of the design of the fan blade which works well in ensuring an extended battery life. It at the same folds flat to a compact size that is easy to store. Some caution should be taken with the batteries though. No mixing of new and old batteries, use only fresh alkaline batteries and do not make the mistake of mixing rechargeable batteries with the carbon-zinc or the alkaline types. The fan measures 6.1 by 2 by 6.5 inches with a weight of 12.8 ounces. 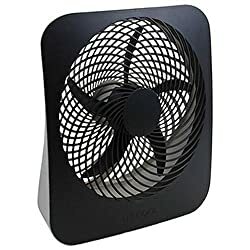 The Image Camping Fan is probably one of the cheapest and most versatile products you can find in this category of fans. The Image Camping Fan is a perfect alternative to the above two products. It doubles up as a lantern as well. If your finances can’t allow you to buy the above products, this product is cheap enough while offering more or less the same quality services. This fan just like many other fans has two-speed settings. You can either choose the high or low settings depending on your cooling needs. It can be placed at different positions as at when needed. This product is durable as a result of the military-grade material that it has been constructed with. The fan together with the light is 20.5-inch around with the fan blades measuring 4 inches across. It is lightweight (1.2 pounds) which makes it easy to carry along with other tools that you might need as part of the camping expeditions. When not in use, simply collapse it to a small and compact size that occupies a little space and hence effortless storage. The fan operates on the 2 D-sized batteries that can run for up to 5 hours on high speed and 15 hours on the low speed. Note that the batteries are not included with this product and are therefore bought separately. Use the handle to suspend it or carry it with a lot of ease. This 6 by 6 by 7 inches fan is ideal for most outdoor activities. You might need to upgrade to a more expensive fan after trying out the other cheaper options. Upgrading class requires money. The quality matches the price though. We have you covered as well with the O2COOL 10-inch Camping Fan with Lights. This 2.4-pound fan measures 11 by 12.6 by 12.8 inches. You can choose to use either the AC adapter or the 6 D-sized batteries to power this fan. The batteries are however not included when buying the fan. It has two speeds that it uses to provide very quiet cooling. You can tilt it in any direction for maximum airflow. It comes with LED lights that have three levels of brightness; nightlight, high and low. These lights can be rotated to angles of 180 degrees. The rugged design makes it perfect for camping and any other outdoor activity. This fan can be folded to a compact size that is easy to store and carry along with other camping tools. Before storing it, make sure that the batteries have been removed, and the fan is in “OFF” position. The built-in handle makes it even more convenient for transportation. You can use this fan on uneven surfaces due to the stability provided by the base pivots. By now you should have realized that not any fan you come across will be good enough for your camping experience. This leads us to the critical discussion on what makes a fan suitable for camping. Below are some of those features you can always look at in a camping fan. When you go camping, there is a high possibility that your campsite will be away from the grid. It, therefore, means that the only source of power that will operate your fan is the batteries. 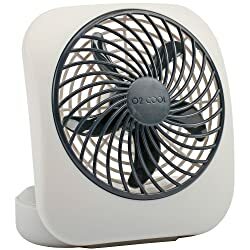 However, the fans with more than one power option are always the best as you can use them both in areas with no electricity as well as in areas with electricity. The number of batteries in a fan differs from one to another depending on ventilator power and runtime. It is recommended that you check on the availability of the type of battery that the fan operates on before buying one. For purposes of convenience, the batteries should be readily available. Also, check on the battery consumption of the fan. A fan that consumes a lot of energy can inconvenience you when it runs out of power at an unexpected time. A fan with many battery slots lasts longer with power compared to the ones with few battery slots. Remember you are going camping, so the fan is not the only thing you need. There are other lots of stuff you have to carry along with you. The lighter the luggage you have is, the more enjoyable the camping experience will be. This brings us back to the individual weights of the items, the fan included. A lightweight fan is easy to carry and even store. This is the reason why most of these camping fans are smaller in sizes compared to the office or house types. The fans have different individual settings and modes of operation. These are the speed settings, airflow settings among others. The fans with two or more speed settings are more convenient as you can extend the battery life by changing the speed according to the weather changes. 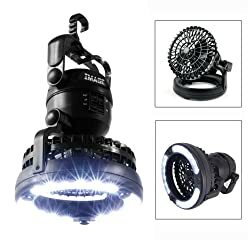 Some fans also come with LED lights which is an added advantage since a single tool can perform two different functions. Others also come with quicker airflow as well as efficient ventilation. Take note that these features vary from one fan to another with prices also differing. Make a choice depending on your convenience and preference. Noise is very annoying. A noisy fan will be a bother to you hence the need to go for a quiet one. The noise produced is always dependent on the type of fan blade you have. Metal blades are the noisiest. Always go for plastic-blade or the sickle-shaped blades as they are the quietest ones. Camping should be free from any form of nuisance. Every camper needs to have a fan to reduce the effects of excessive heat at the campsite. The process of getting and ideal fan can be complicated because the market is nowadays flooded with several brands of camping fans. This article has however highlighted everything that you need to acquire an ideal camping fan. 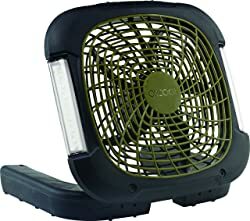 While all the four camping fans above will work for you, the O2COOL 10-inch Camping Fan with AC Adapter is the best camping fan. This fan has two different power sources which make it perfect for camping in areas with or without electricity. It is light in weight with a built-in handle that makes it easy to store and carry. Operating using 6 D-sized alkaline batteries and the blade design that maximizes on airflow, be sure to have an extended battery life since there will be sufficient use of energy. It operates quietly on the two-speed settings that it comes with. Have you ever used any of the best camping fans brands that we have discussed above? If yes, which one have you used before and how can you describe its performance? Do you have another better camping fan brand that you would like us to consider in our next review? Camping fans are the good choice for the camping trip in summer. If your trip in 1 week, your camping fan is not enough battery for activity all trip. Yes! You are right, Solhim. The camping generator is a good idea.